Okay so Sadie wanted to do POLKA DOTS today! So we have raisin dots, sandwhich dots, tic tac dots, cheerio dots, marshmallow and chocolate chip dots and pistachio and cranberry dots! 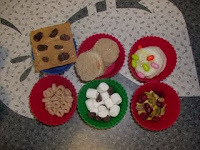 There are a ton of great muffin tins going on....go seehttp://michellesjournalcorner.blogspot.com/ !!!! Love it! Love polka dots! When I was young, I remember "dotted swiss" was big. Do you remember that fabric? Oh yes! Dotted Swiss is very pretty!